Not going to lie – I’ve eaten a disgusting amount of cookie dough in my life and I really should probably be ashamed of it (I’m not). At some point I think I stopped bothering with baking the cookies and just saved the dough for snacking. Why bother going through the whole rigamarole of actually making cookies when I’m just after the good stuff? 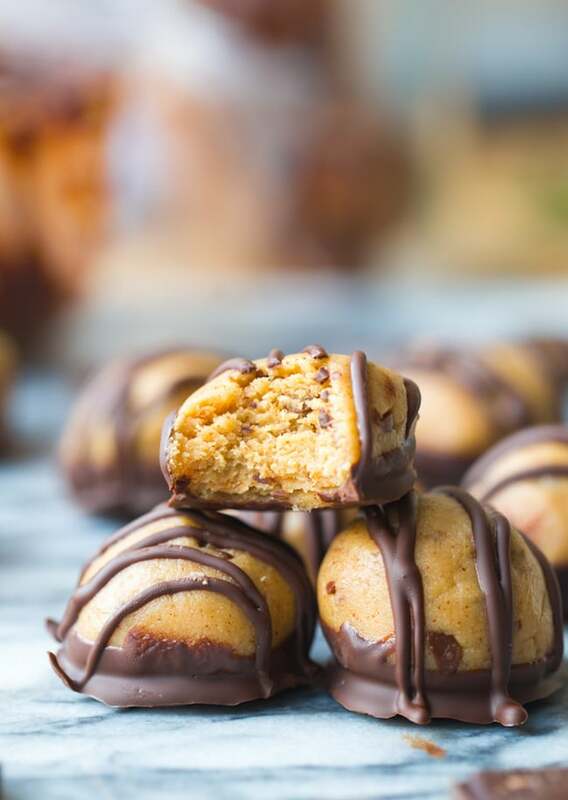 That’s where these peanut butter cookie dough truffles come it. 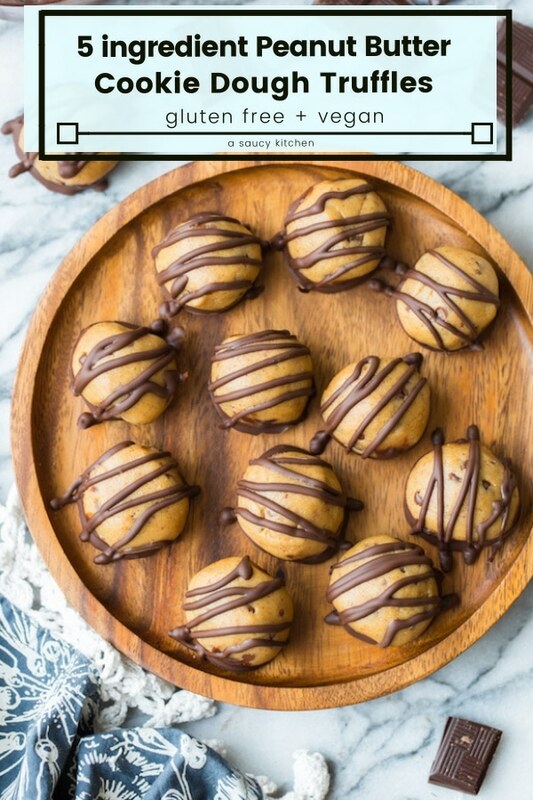 For all my fellow peanut butter and cookie dough lovers out there – these are for you. It’s really just a matter of mixing up the dough in one bowl and melting the chocolate in another. Once the dough is mixed, roll into tablespoon sized balls and place in the fridge to harden slightly while the chocolate melts. Next, just dip and drizzle the chocolate over the balls and place back in the fridge for a quick trip until the chocolate solidifies. Easy! Not bad for a gluten free vegan snack that you can whip up in about 20 minutes. 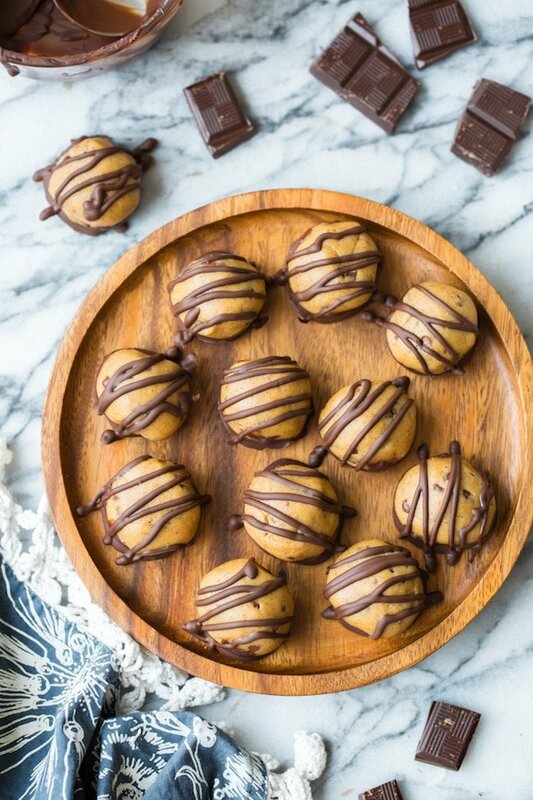 Don’t forget to #asaucykitchen on instagram if you these Peanut Butter Cookie Dough Truffles! I love seeing what you make! You can also post your pictures to my facebook page! In another medium sized mixing bowl mixing together the peanut butter and maple syrup. Once mixed add in the coconut flour and salt until fully combined. Stir in 2 tablespoons of the chocolate chips. Scoop out the dough using a tablespoon and roll into little balls. Place the cookie dough in the freezer for about 10 minutes so that it hardens slightly and becomes easier to handle. While the dough is in the freezer melt the chocolate. Double Boiler Method: Place chocolate in a heat proof bowl that’s large enough to sit over the top of a small sauce pan. Add an inch of water to the sauce pan and bring to a simmer. Once the water is simmering place the bowl of chocolate over the top of the bowl, make sure that the water doesn’t touch the bottom. Stir the chocolate as it melts. When there are only a few chunks of chocolate left remove the bowl from the heat. The residual heat will be enough to melt the rest. Set the bowl aside to let the chocolate cool. Microwave Method: Place the chopped chocolate in a heat safe bowl and pop in the microwave to melt at 30 second intervals stirring in-between so the chocolate doesn't start burning. 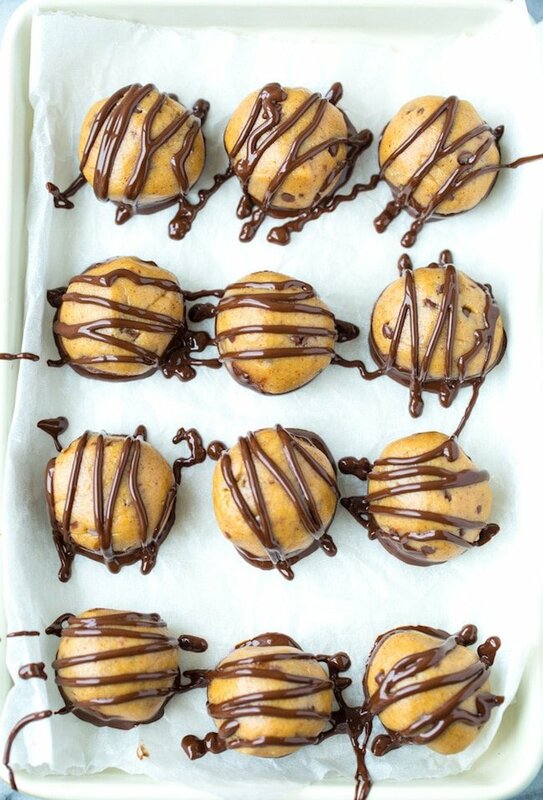 Take the dough balls out of the freezer. Dip the bottom of the truffles into the melted chocolate. Let the excess chocolate drip off and place on a baking sheet lined with baking parchment to dry. Repeat with the remaining truffles. When all the balls have been dipped, drizzle the remaining chocolate over the top. Pour the remaining chocolate in a small ziplock bag. Snip off a small corner of the bag and pipe the chocolate out of the bag through the corner and over the truffles. Place back in the freezer until the chocolate solidifies another 10 minutes then enjoy. Store these in an airtight container in the fridge for up to 2 weeks or in the freezer for about a month. Store these in an airtight container in the fridge for up to 2 weeks or in the freezer for about a month. If I use sunflower butter do I have to change anything else? Peanut butter gives me headaches. Hi Kathryn! You won’t need to change a thing! Could you sub any kind of flour for the coconut flour? Coconut allergy here. Hi Kerri! I have made these using almond flour! You’ll need about 1 full cup of flour though because almond isn’t as absorbent as coconut. Hope that helps! You give nutrition information per serving but don’t state how many truffles are in a serving?